Are you looking for sabot slugs for your rifled shotgun? Well, check out this Federal Trophy Copper slug! Federal created this round for hunters looking for a sabot slug with greater muzzle velocities and increased range. This slug has a 300 grain polymer tipped all-copper slug. The slug has a range of about 200 yards, and has a muzzle velocity of about 2000 feet per second. This slug is designed much like many rifle rounds; it has scoring at the top of the copper bullet that greatly resembles a hollow point self defense round. After impact, the polymer tip on the slug causes rapid and devastating expansion. When you hit vitals, your game will hit the ground immediately. 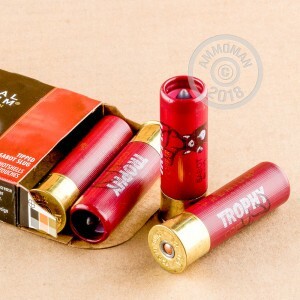 This ammo is lead free, and can be used in states and hunting areas that have restrictions on lead ammunition. If you are ready to hunt with the best, order this ammo today... it might not be in stock for long. 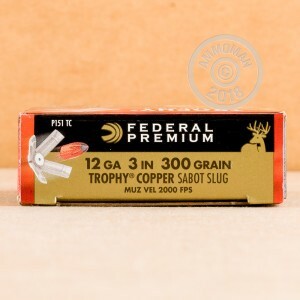 Federal Premium consistently produces some of the best ammunition on the market. Their products are consistent and reliable. All of their hunting ammunition is top-of-the-line, and for hunters that prefer not to hunt for their game after they shoot it.